COMMENTS:        This trigger occurred at longitude,latitude = 43.53,-4.10 [deg]. COMMENTS:        NOTE: This GBM event is temporally(2.0<100sec) coincident with the CALET_GBM event (trignum=1157563166). COMMENTS:       NOTE: This SPIACS event is temporally(2.0<100sec) coincident with the FERMI_GBM event (trignum=495220783). COMMENTS:        NOTE: This GBM event is temporally(2.0<100sec) coincident with the INTEGRAL_SPIACS event (trignum=7560). "At 17:19:39.15 UT on 10 September 2016, the Fermi Gamma-Ray Burst Monitor triggered and located GRB 160910A (trigger 495220783 / 160910722). The on-ground calculated location, using the GBM trigger data, is RA = 221.8, DEC = 39.6 (J2000 degrees, equivalent to 14 h 47 m, 39 d 38 '), with an uncertainty of 1 degrees (radius, 1-sigma containment, statistical only; there is additionally a systematic error which we have characterized as a core-plus-tail model, with 90% of GRBs having a 3.7 deg error and a small tail suffering a larger than 10 deg systematic error. [Connaughton et al. 2015, ApJS, 216, 32] ). The trigger resulted in an Autonomous Repoint Request (ARR) by the GBM Flight Software owing to the high peak flux of the GRB. This ARR was accepted and the spacecraft slewed to the GBM in-flight location. The initial angle from the Fermi LAT boresight to the GBM ground location is 71 degrees. The GBM light curve shows a single pulse with a duration (T90) of about 24.3 s (50-300 keV). The time-averaged spectrum from T0 to T0+32.3 s is best fit by a Band function with Epeak = 347 +/- 9 keV, alpha = -0.78 +/- 0.01, and beta = -2.23 +/- 0.04. The event fluence (10-1000 keV) in this time interval is (8.41 +/- 0.06)E-5 erg/cm^2. The 1-sec peak photon flux measured starting from T0+8.2 s in the 10-1000 keV band is 76.5 +/- 0.5 ph/s/cm^2. At 17:19:39 on September 10, 2016 Fermi-LAT detected high-energy emission from GRB 160910A, which was also detected by Fermi-GBM (trigger 495220782/160910722; Veres et al. GCN #19901). with an error radius of 0.35 deg (90 % containment, statistical error only). The GBM location was initially at the edge of the LAT field of view at an angle of 71 degrees to the LAT boresight and triggered an autonomous repoint of the spacecraft. The highest-energy photon is a 500 MeV event which is observed 9 ks after the GBM trigger. The Fermi-LAT point of contact for this burst is Dan Kocevski (daniel.kocevski@nasa.gov). Swift-XRT has performed follow-up observations of the Fermi/GBM (Veres et al., GCN Circ. 19901) and Fermi/LAT (Racusin et al., GCN Circ. 19902) detected burst GRB 160910A in a series of 4 observations tiled on the sky. The total exposure time is 5 ks, distributed over 4 tiles. The data were collected between T0+35 ks and T0+47 ks, and are entirely in Photon Counting (PC) mode. with an uncertainty of 4.3 arcsec (radius, 90% confidence). This position is 0.34 deg from the Fermi/LAT position and 0.6 deg from the GBM position. The light curve built with the data collected so far is consistent with a constant source of mean count rate (1.0 +/- 0.1)e-01 ct/sec. More data are required to search for a fading behaviour. A spectrum formed from the PC mode data can be fitted with an absorbed power-law with a photon spectral index of 1.7 (+0.6, -0.6). The best-fitting absorption column is 1.3 (+1.7, -1.3) x 10^21 cm^-2, consistent with the Galactic value of 1.0 x 10^20 cm^-2 (Willingale et al. 2013). The [absorbed] unabsorbed 0.3-10 keV flux is 5.1 (+1.6, -1.0)e^-10 erg cm^-2 s^-1 [4.7 (+2.1, -1.3) e-10 erg cm^-2 s^-1]. COMMENTS:       Swift is performing multiple tiled observations of this GRB. COMMENTS:       This object is uncatalogued. COMMENTS:       The INTENSITY is the OBSERVED flux. COMMENTS:       See http://www.swift.ac.uk/xrt_products/TILED_GRB00058/index_1.php for more details. We encourage further follow-up and spectroscopy of this bright afterglow. D. Malesani (DARK/NBI and DTU Space), D. Xu (NAOC/CAS), A. de Ugarte Postigo (IAA-CSIC and DARK/NBI), R. Tronsgaard Rasmussen (NOT), P. Blay (NOT/IAC), report on behalf of a larger collaboration. We observed the field of the Fermi GRB 160910A (Veres & Meegan, GCN 19901; Racusin & Kocevski, GCN 19902) with the Nordic Optical Telescope (NOT) equipped with the AlFOSC imaging camera. The expected uncertainty is <0.5". Comparing with nearby SDSS stars, we measure for the afterglow a magnitude r = 19.65 +- 0.01 (AB) at a mean time of Sep 11.8487 UT (27.04 hr after the GRB trigger). The long-duration GRB 160910A (Veres et al., GCN Circ. 19901; Racusin et al., GCN Circ. 19902; INTEGRAL-SPI/ACS trigger #7560) triggered the CALET Gamma-ray Burst Monitor (CGBM) at 17:19:41.25 on 10 September 2016. The burst signal was seen by all CGBM instruments. The light curve of the SGM shows an initial weak peak followed by a main bright peak. The weak initial peak starts at T0, peaks at T+3 sec and ends at T+4 sec. The main bright peak starts at T+4 sec, peaks at T+6 sec and ends at T+20 sec. Several overlapping pulses are evident in the main peak. 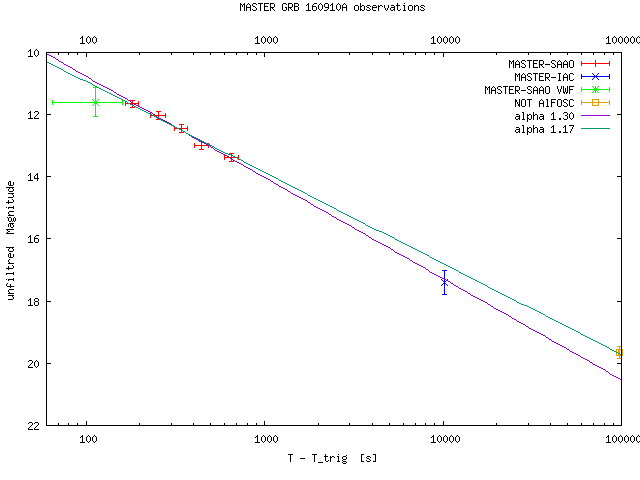 The T90 duration measured by the SGM data is 20.7 +- 1.5 sec (40-1000 keV). The CALET data used in this analysis are provided by the Waseda CALET Operation Center located at the Waseda University. Due to technical issues, GCN 19905 was issues with an incorrect encoding and GCN 19906 was contained the wrong name and URL. "The [absorbed] unabsorbed 0.3-10 keV flux is 5.6 (+1.4, -1.2) x 10^-12 erg cm^-2 s^-1 [4.9 (+1.9, -1.4) x 10^-12 erg cm^-2 s^-1]." We thank M. De Pasquale for spotting the mistake. We apologize for any confusion. The long-duration, very intense GRB 160910A (Fermi GBM observation: Veres & Meegan, GCN 19901; Fermi-LAT detection: Racusin & Kocevski, GCN 19902; CALET Gamma-Ray Burst Monitor detection: Kawakubo et al., GCN 19909) triggered Konus-Wind at T0=62379.089 s UT (17:19:39.089). The burst light curve starts with an initial weaker emission followed by a main bright peak with a duration of ~50 s. The main pulse is followed by a long weak tail seen up to ~T0+150 s. The emission is seen up to ~10 MeV. As observed by Konus-Wind, the burst had a fluence of 1.36(-0.09,+0.10)x10^-4 erg/cm2, and a 64-ms peak energy flux, measured from T0+5.120 s, of 3.51(-0.32,+0.32)x10^-5 erg/cm2/s (both in the 20 keV - 10 MeV energy range). The time-integrated spectrum of the burst (measured from T0 to T0+47.872 s) is best fit in the 20 keV - 15 MeV range by the GRB (Band) model with the following parameters: the low-energy photon index alpha = -0.81(-0.06,+0.07), the high energy photon index beta = -2.16(-0.12,+0.09), the peak energy Ep = 315(-29,+31) keV, chi2 = 97/98 dof. The spectrum near the peak count rate (measured from T0+4.864 to T0+6.400 s) is best fit in the 20 keV - 15 MeV range by the GRB (Band) model with the following parameters: the low-energy photon index alpha = -0.15(-0.10,+0.10), the high energy photon index beta = -2.27(-0.09,+0.07), the peak energy Ep = 266(-19,+21) keV, chi2 = 100/69 dof. MASTER-SAAO robotic telescope (MASTER-Net: http://observ.pereplet.ru) located in SAAO was pointed to the FERMI GBM GRB160910.72 15 sec after notice time and 65 sec after trigger time at 2016-09-10 17:20:45 UT. On our first (20s exposure started 75 sec after GBM trigger) set we do not found optical transient within FERMI error-box (ra=14 54 00 dec=+39 23 00 r=3.41, trigger 495220783 / 160910722 (Veres and C.Meegan, GCN 19901)) because very low altitude on horizont ~3 degrees (one tube was under the roof). Fortunatelly, we saw OT by one of two MASTER Very Wide Field Cameras (5 sec expositon, 0.25 sec readout) . On MASTER-SAAO VWF Camera we see OT at 3 sigma confidence level with magnitude 11.6 +- 0.5 mag on a co-added images with total exposure 95 seconds (19 x 5 sec) starting at 17:20:45 i.e. 65 sec after trigger time. Mean time is 113 sec after trigger. On our second MASTER-SAAO (30s exposure) set started at 2016-09-10 17:22:26 (167 sec after trigger time) we found OT within FERMI error-box with unfileterd magnitide m = 11.6+-0.1 . The second exposition was making after receiving new Fermi GBM coordinates. MASTER-IAC robotic telescope (MASTER-Net: http://observ.pereplet.ru) located in IAC was starting survey on the FERMI GBM GRB160910.72 error-box (ra=14 46 14 dec=+39 25 10 r=1.0) 11142 sec after notice time and 11239 sec after trigger time at 2016-09-10 20:26:58 UT. The 5-sigma upper limit on our first (60s exposure) set is about 18.3 mag . The OT unfiltered magnitude is 17.4+-0.4 . The MASTER-SAAO and NOT combined power law index alpha = 1.17+-0.02 . All MASTER observations was done before LAT alert. The Swift/UVOT began settled observations of the field of GRB 160910A 196954 s after the Fermi/GBM (Veres et al., GCN Circ. 19901) and Fermi/LAT (Racusin et al., GCN Circ. 19902) triggers. We detect a fading source consistent with the XRT position (D'Ai et al., GCN Circ. 19904) and optical detections (de Ugarte Postigo et al., GCN Circ. 19907; Malesani et al., GCN Circ. 19908; Lipunov et al., GCN Circ. 19914; Mazaeva et al., GCN Circ. 19919). The magnitudes in the table are not corrected for the Galactic extinction due to the reddening of E(B-V) = 0.01 in the direction of the burst (Schlegel et al. 1998). Photometry is based on nearby SDSS-DR9 stars used in GCN 19919 (Mazaeva et al.). We observed the Fermi/LAT GRB 160910A (Racusin et al., GCN 19902) with the AMI Large Array at 15 GHz on 2016 Sep 12.65, Sep 13.68, Sep 15.67, and Sep 20.68 (UT) as part of the 4pisky program. We detect the radio afterglow at the NOT location (Malesani et al., GCN 19908) at flux densities of 791+/-55 uJy, 1151+/-82 uJy, 840+/-146 uJy, and 462+/-39 uJy respectively. Analysis of Astrosat data showed the CZTI detection of a very bright GRB160910A (Fermi-GBM detection: P. Veres et al., GCN Circ. 19901). The source was clearly detected in the 40-200 keV energy range. The light curve shows a single peak at 17:19:47.15 UT, 8 seconds after Fermi Trigger at 17:19:39.15 UT and a peak count rate of 1738 counts/sec above the background (four quadrants summed together), with a total of 7184 counts. The local mean background count rate was 343 counts/sec. Using cumulative rates, we measure a T90 of 9.44 secs. CZTI GRB detections are reported regularly on the payload site at http://astrosat.iucaa.in/czti/?q=grb . CZTI is built by a TIFR-led consortium of institutes across India, including VSSC, ISAC, IUCAA, SAC and PRL. The Indian Space Research Organisation funded, managed and facilitated the project. We carried out Giant Metrewave Radio Telescope (GMRT) observations of GRB 160910A (Veres et al. 2016., GCN Circ. 19901. , Racusin et al. 2016., GCN Circ. 19902) at 1390 MHz band on 2016 Sep 27.21 UT. We detect a 4-sigma source within the XRT error circle (D'Ai et al. 2016., GCN Circ. 19904) with a flux density of 185+/-69 uJy. This is likely to be the radio afterglow of GRB 160910A. Map rms is 35 uJy.